Seven athletes with links to the area will join around 1,600 elite competitors in England next month for the four-day School Games. Aimee Gale, Alana Doyle, Angela Sagayno, Craig Taylor, Mathieu Outhwaite, Ross Good and Ryan Upton have been selected for volleyball and hockey at the high-profile multi-sports tournament from September 1-4. Portadown College’s Gale, Sagayno and Good will represent Northern Ireland on the volleyball court. Two pupils from Craigavon Senior High School have been called up - with Taylor and Upton team-mates in Northern Ireland’s volleyball squad. Outhwaite from Southern Regional College will also feature with the national volleyball panel. Royal School Armagh’s Doyle is set to compete with Ulster’s hockey group. Twelve sports - seven of which include disability disciplines - have been listed on the schedule across Loughborough University and Sheffield venues thanks to support from National Lottery funding from Sport England delivered by the Youth Sport Trust. Doyle is on the books at Ards and will be competing across her fourth School Games. Taylor has described his pride at “representing my country” and considers the competition “a fantastic opportunity to play against other national teams”. 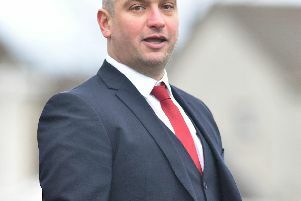 Outhwaite can call on past School Games experience, plus April’s European Championships - with Good, his Aztecs team-mate at the Craigavon-based club, “excited to represent my country”.